Just 30 minutes of daily exercise can alleviate the risk of heart attack and diabetes, says the World Health Organization. Along with “walking buses” and bicycles that play videogames, an adaptable concept of exercise is helping a busier world stay in shape. WALKING: Stand tall and look directly ahead. Keeping your chin up will reduce strain on your neck and back. Elbows should be at your sides at a 90-degree angle. To walk faster try rolling your feet from heel to toe. This requires flexible shoes. ROWING MACHINE: Keep your back straight as you pull, and make sure to contract your abs. Initiate movement by pushing with hips and legs rather than pulling with arms and lower back. 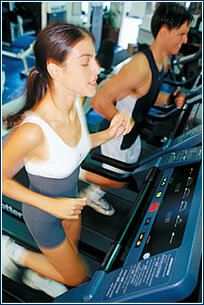 STATIONARY BIKE: Adjust the seat; it’s too high if your hips rock as you pedal and too low if your knees hurt afterward. To protect your knees, spin at 90 rpm or higher. If you’re struggling, lower resistance. THE NEXT DECADE will see a trend towards home workouts. “Working longer hours, crowded gyms at peak times and queues for equipment has fuelled the trend for exercising at home,” says Nick Cahusac; managing marketer of the independent fitness retailer, UK’s Fitness Workout. Some of the new, home sweat-sessions will merge entertainment with exercise. The new Reebok Cyber Rider is a good example. Instead of “pay as you go” at a gym, you can take this bike with built-in game controllers and “play as you go.” The faster you pedal, the faster your game of choice – computer or Playstation – plays. Another new invention claiming to be an improvement on the traditional is the WaterRower. Despite its name, you don’t need an indoor pool to use it. In fact, the only water needed is the H20 poured into its Water Flywheel. Filling this empty orb with liquid simulates a drag effect, much like being in an actual boat. This allows consistent resistance, evenly working the legs, torso and arms. In contrast, conventional rowers start heavy on each pull and finish light. Since this exercises the legs first, they can get overbuilt. Despite this exciting new technology, many people are choosing conventional methods. Hiking, walking, cycling, bowling, and squash enjoy sustained popularity. While walking in particular has persisted, perhaps out of simple necessity, people are taking a new approach to this old habit. The UK’s growing trend of “walking buses” is one example. These consist of groups of children walking to school with their parents along recognized bus routes. On the way, they collect other children. Participants say the benefits of these “walking buses” include being social, safe, and good for the environment. Cycling is also globally friendly, but with different benefits. Like walking, cycling increases cardiovascular health, but adds the benefit of working the quadriceps and hamstrings. If you’re thinking of taking up cycling, try venturing out with your parents. Age-friendly fitness is growing in popularity. Recognizing this, the Netherlands’ national cycling organization now runs courses for older cyclists to encourage them to keep pedaling. But not everyone enjoys long periods of exercise. Thankfully, we can get the benefits of fitness without dripping sweat until we drop. The World Health Organization insists that short bursts of activity, whether stretching at the desk or doing a long stretch of dishes, is heart healthy – as long as it totals 30 minutes daily. This also includes the sporadic squat-and-stroll of bowling, which feels more like play than physical work. Even these small efforts will reduce our risk of obesity. However, there’s something to be said for effort-induced-perspiration. Along with laughter, it’s one of the few prescription-free ways of enjoying painkilling, feel-good endorphins.